Hello everyone! And welcome to another round of the hottest news and happening from the marketing world. Past week saw Europe setting a lawsuit against Facebook, charging the social giant with illegal use and sharing of user data (even launching its social graph!). Then we have some horrified SEO experts wondering why businesses are responding to Big G’s mobilegedon with simple mobile sites, the social analytics firm SumAll releasing a more AI social analytics tools to remove guesswork, twitter killing its #Discover from mobile searches, and Rand Fishkin tackling personalized search for us! Because Google was not Enough — Europe now Rears against Facebook with a Lawsuit. Privacy watchdogs have found Facebook violating user privacy (as dictated by the EU laws). Max Schrems, an Austrian Law Student is pursuing a lawsuit on behalf of 25,000 people. The violations range from aiding the U.S NSA’s data mining program “PRISM”, to illegally sharing of data with external apps and introducing the Graph Search. Earlier we saw EU (grand jury and judge) go after Google in what could be the biggest law suit since Microsoft’s Internet Explorer, now Facebook. Is it perhaps because both of them are not from Europe? Read the details at SEL! The Big G’s Mobilegedon is near — will Your SEO Survive It? Google will be releasing its mobile-friendly algorithm on April 22nd. That’s just two weeks into the future and still many businesses are not ready for the latest release or content with simply making a mobile website. And experts believe it’s not enough. Google’s update is one of the most extensive algorithm updates to date, and businesses must work on several other dimensions to win the mobilegedon. Learn what you need to pass Big G’s latest test at Search Engine Land! Even with all the analytics tools in place, social marketers still find it hard to use social insights to make informed decision without relying on intuition and guesswork. This is where the social analytics firm comes in with a new service to help social media managers increase ROI and improve performance on their social networks. The new service leverages your social metrics to derive and give recommendations about what, when and how to post your social content for maximizing brand reaches and engagement. Will we be getting more targeted and insightful advice tailored to our audience and industry? Read the details at Marketing Land! Twitter has been working on ways to blend content into user’s timeline and pushing for more context driven discovery of content for its users. Hence, very soon twitter’s mobile user base will see descriptions under every trending topic, making it easier for them to assess context and relevance of the topic. Twitter however has decided to retain the #Discover hastag for its web platform. Better Search Personalization — White Board Friday! Google is a behemoth when it comes to guzzling and organizing user data to create extremely extensive user profiles and search behavior studies. This has a lot of benefits for the search giant, but how can we as marketers leverage the data to improve performance in personalized searches? 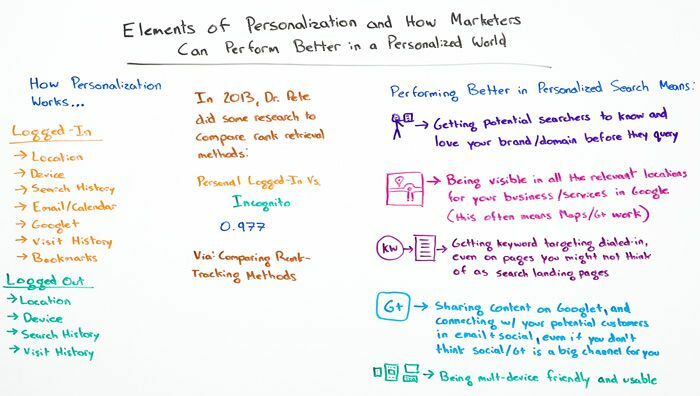 In today’s White Board Friday, Rand Fishkin details about using personalization details of both logged in and logged out users and making discovery easy for personalized searches. This entry was posted in No category on 10.04.2015 by admin.